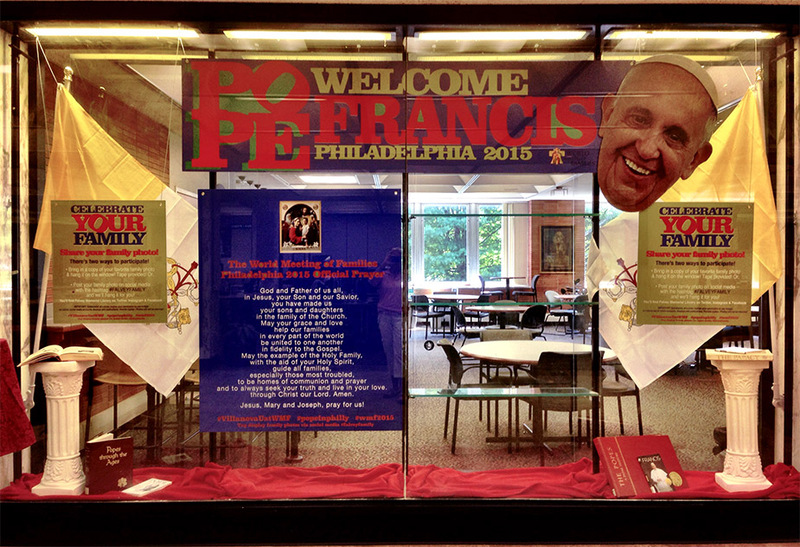 To celebrate the visit of Pope Francis to Philadelphia and the World Meeting of Families – Philadelphia 2015, Joanne Quinn, Falvey’s graphic designer, created the “Welcome Pope Francis” window exhibit. The World Meeting of Families, an international conference on the family, meets September 22-25. Pope Francis will visit Philadelphia September 26-27. In the spirit of the World Meeting of Families congress that precedes the Pope’s visit, Villanova students, faculty and staff are invited to share their family photographs with the University community by including them in the window display. You have two ways to participate: bring in a copy of the photograph and hang it on the window or post the photograph on social media with the hashtag #FalveyFamily (Falvey Memorial Library is on Twitter, Instagram and Facebook). Quinn asks participants to submit copies, not original photographs; the photographs will not be returned. She adds, “Submission of a photo implies your permission to use images on library social media accounts, displays and publications.” You may submit photos now; this is your chance to be part of a world-wide celebration of families. A large banner welcoming Pope Francis flanked by a “big head” portrait of the pope leads the viewer into the display. Two posters inviting people to “Celebrate your family,” a large poster displaying “The World Meeting of Families Philadelphia 2015 Official Prayer” and accompanying official image, two papal flags and assorted books about Pope Francis and other popes complete the exhibit. A large open space is for the family photos. Kallie Stahl, Outreach student employee, assisted with the design and mounting of the display. This eye-catching exhibit is in the large window to the left of the entrance to Falvey’s Holy Grounds, visible to anyone entering the Library. The exhibit will be up until the end of October.